Leavened and unleavened bread are nutritionally similar. Leavened bread contains baking yeast, baking powder or baking soda – ingredients that cause the dough to bubble and rise and create a light, airy product. Unleavened bread is a flatbread, often resembling a cracker. Other than the leavening agent, the ingredients in the two kinds of bread are similar. Reasons for choosing unleavened bread over leavened bread include religious observance and treatment for candidiasis. Plain white bread leavened with yeast contains 75 calories, 2 grams of protein, 14 grams of carbohydrate and less than 1 gram of dietary fiber per ounce. White bread leavened with baking soda – also called Irish soda bread – has similar nutritional content, containing 82 calories, 2 grams of protein, 16 grams of carbohydrate and less than a gram of dietary fiber per ounce. Plain, unsalted matzo crackers, a common variety of unleavened bread, have 112 calories per ounce, 3 grams of protein, 23 grams of carbohydrate and a gram of dietary fiber. Matzo bread is denser in calories, protein and carbohydrate than leavened bread because it is dry, with only about 1 gram of water per ounce. White bread and soda bread contain 8 to 10 grams of water per ounce. Neither leavened white bread nor unleavened matzo bread is a rich source of micronutrients, though both contain small amounts of B vitamins and iron. Unsalted matzo bread is sodium free; commercially prepared white bread contains 145 milligrams of sodium, while soda bread has 113 milligrams. To get the most from either bread product, choose whole-wheat varieties. 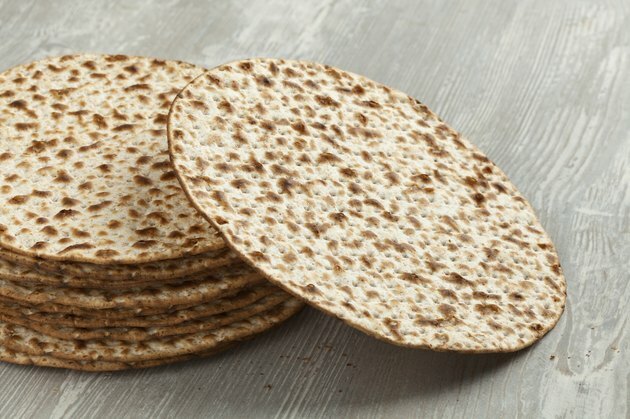 An ounce of whole-wheat matzo crackers contains 100 calories, 4 grams of protein and 3.4 grams of fiber – nearly 14 percent of the 25 grams of fiber that the Dietary Guidelines for Americans, 2010 recommends that women consume each day and nearly 10 percent of the 38 grams that men should consume daily. An ounce of whole-wheat bread has 70 calories, 4 grams of protein and 2 grams of dietary fiber. Candida albicans, a fungus, causes vaginal yeast infections and may be responsible for systemic infections presenting symptoms such as fatigue, headache, digestive ailments and mood disruptions. Diagnoses of systemic yeast infection, or candidiasis, are controversial, and alternative practitioners may recommend a special diet as a treatment. A candida-fighting diet disallows yeast-containing foods such as beer and yeasted bread. Unleavened bread may be a suitable substitution, but candida diets commonly forbid foods containing white flour as well. If you're following a candida diet, check with your healthcare provider to determine what bread, if any, is allowable. Passover, a major Jewish holiday, lasts for seven days in March or April and requires worshipers to forgo leavened bread for the duration. Matzo bread is traditionally served at Seder, a family dinner celebration. Matzo bread is available year-round, but during Passover, grocery stores sell many varieties and an array of other unleavened baked goods. Matzo bread for Passover must meet strict criteria to be considered kosher; for example it must be baked at high temperatures, and the dough must contain a certain type of water.